Alan Archibald said his Partick Thistle side had proved they have the character to beat the drop after they beat Kilmarnock 2-1 at Rugby Park. Aaron Taylor-Sinclair headed in a late winner to move the struggling Jags away from the relegation play-off spot. Kimarnock led through Vitalijs Maksimenko but Kallum Higginbotham scored a free-kick three minutes later. "I thought we showed great character to come from a goal down to win the game," said Archibald. The result moves the Firhill side above Ross County ahead of Friday night's clash with St Mirren and means any one of the five teams above Hearts could end up in the play-off position. "I think, when you're a goal down, you settle for a point," he told BBC Radio Scotland. "But I think, when we got the goal back, we were always confident we had the players on the pitch that we could go and get another goal. "They've been questioned a few times about their character because we've had a few bad results over the season, but they've always bounced back. "It was important we done that today to bounce back from the Hearts game. "I think you see what's at stake and both teams gave their all, it made for an entertaining game. "We just go for the St Mirren game now. We're at home, our record's not been great at home this season, but you see the backing we had today - the fans were fantastic in their numbers. "Hopefully they turn out on Friday and back us and we put on a performance for them again. "It was just vital that we got a good result and a good performance today." 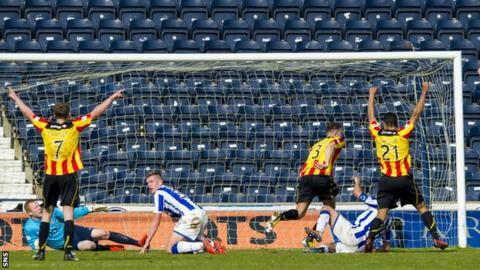 The Partick Thistle manager praised goalkeeper Paul Gallagher, with the 34-year-old pulling off a number of vital stops. "He's done really well," he said. "His experience has helped at the back. "But he's made some crucial crucial saves for us as well, he's kept us in the game today at a vital point in the match. "He also got booked for dissent, so he'll get fined for that as well!"